Backscatter systems have become more and more popular since radio-frequency identification (RFID) emerged a few years ago. Recent advances in short-range indoor backscatter localization, however, have shown that there is little to no information available on wideband backscatter channels despite the abundance of analyses available for single-channel links. Instead of presenting backscatter channel analyses, we present a method to calculate wideband backscatter channel characteristics from existing single-channel measurements. The presented method holds for bistatic as well as monostatic antenna setups and will be published in one of the upcoming issues of IEEE Transactions on Antennas and Propagation. The above image shows a comparison between the RMS delay spread calculated from single-channel measurements (x-axis) and the RMS delay spread estimated directly from the corresponding backscatter channel (y-axis). 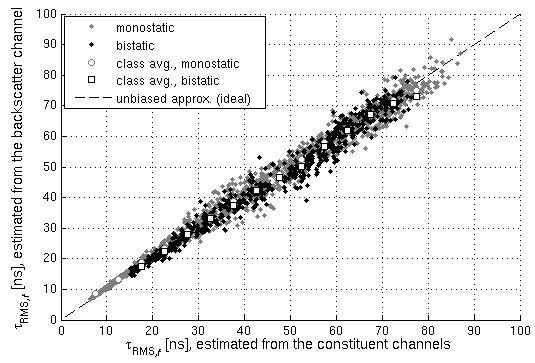 Note that the dots cluster around the dashed line, which means that indeed the RMS delay spread calculated from the single-channel link matches the measured backscatter parameter. Read more in our publication or in the PhD thesis!